Of the one hundred Pilgrims who settled at Plymouth in 1620, nearly half had died within months of hardship, starvation or disease. One of the colony's most urgent challenges was to find ways to grow and prepare food in the harsh, unfamiliar climate of the New World. From the meager subsistence of the earliest days and the crucial help provided by Native Americans, to the first Thanksgiving celebrations and the increasingly sophisticated fare served in inns and taverns, this book provides a window onto daily life in Colonial America. It shows how European methods and cuisine were adapted to include native agriculture such as maize, potatoes, beans, peanuts and tomatoes, and features a section of authentic menus and recipes, including apple tansey and crab soup, which can be used to prepare your own colonial meals. Ann Chandonnet is a food historian, poet and journalist. She is a member of the Culinary Historians of Washington, DC, and is the author of the award-winning Gold Rush Grub and The Pioneer Village Cookbook. She lives in Charlotte, NC. 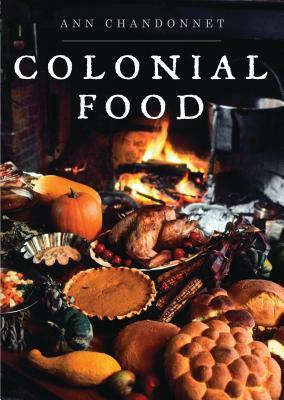 “In this lean book, Ann Chandonnet manages to cover the wide variety of Colonial food, exploring the foodways of the original 13 colonies, but also reaching into French and Spanish territories, as well as Native American food. Her wide reach makes it clear that Colonial food had a varied character, based on the settler's own traditions, what they found in the New World, and how they interacted with other communities.” —Culinary Historians of Washington, D.C.